The MOJAVE heater is designed to simplify the task of providing heat and comfort to your ride. It eliminates the need to locate hard-to-find parts, or go through expensive rebuilds to get old units in working order. Its design offers several mounting options, and the optional Plenum includes adjustable louvers and a flange for defroster ducting. The Mojave gets it heat from the hot water in your vehicle's cooling system (just like an O.E. unit), but has the advantage of fitting into a wide variety of confined spaces. Its compact size, ease of installation and operation make it the ideal replacement unit. Uses your engines existing cooling system to heat air, not an electric or gas heater. Small enough to mount under dash or under seat to provide heat to the rear of vehicle. 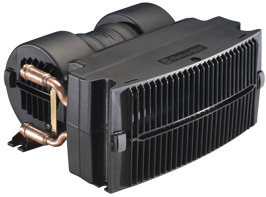 Optional Plenum box has 2 directional vents, and an outlet for 2 1/2" vent hose, for use with defroster. 10 1/8" x 9" x 5"
The Optional Plenum and louvers can direct the air or let the unit double as a defroster with two adjustable heater vents.